Turkeys, Christmas lights and noisemakers – these are signs that the winter holiday season is officially upon us! With so much excitement surrounding this special time of the year, it’s understandable that you may be preoccupied with planning events, hanging out with friends and family and holiday shopping; and may not be aware of things you should know about riding DCTA during the winter to ensure you get where you need to go this holiday season. Make sure to view our entire 2018-2019 holiday service schedule to plan your DCTA travel in advance! If flying American Airlines or only traveling with carry-on luggage, enter through Terminal 1. If not, take the Terminal Link airport shuttle bus to appropriate terminal. Click here for more DCTA transit connections! We get that the winter is a joyous occasion, but we want to ensure you remember some key safety tips when riding our system this holiday season. 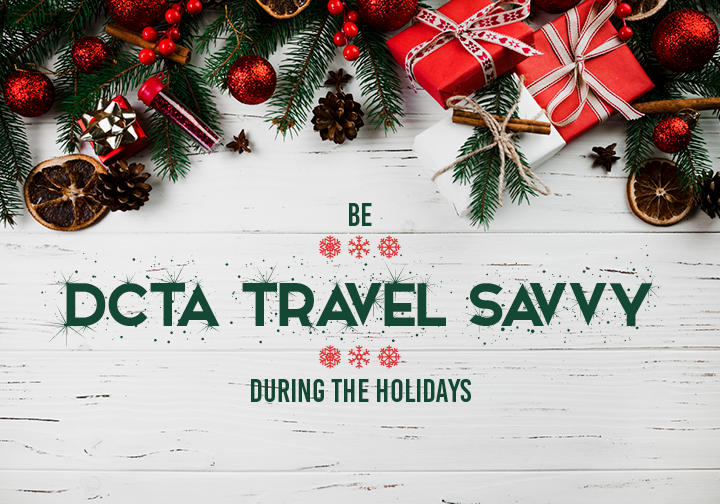 We’ve gathered up some of our best winter holiday tips for you to remember for a safe and fun-filled holiday season riding DCTA! Did we miss something in our tips that you’re burning to know! Leave us a note in our comment section below.